It looks like NOW we have a horse race! We have a lot of pictures to go through for week 6 and next week, week 7 is getting really interesting. Picking the camera winner at the end of the year will be very very tough. We may have to invite a celebrity judge to help us out. I have been re-miss in my duties for not naming previous winners sooner though. 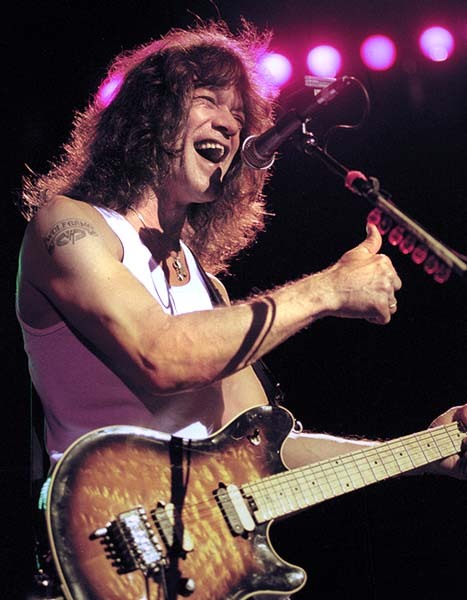 This shot of Eddie Van Halen at Alpine Valley to the left won a T-Shirt in week 3 for Terry Mayer. This picture of Nine Inch Nails by Robert Olson won him a T-Shirt for week 5. If you would like to enter the contest to win one of our weekly T-Shirts or a chance to win Nikon's brand new 10.2 Mp D80 DSLR camera kit for Christmas, a $1000.00+ value, upload some of your best concert pics to our Photo Contest Gallery. Enter as many concert photos as you like and as often as you like. You may only win 1 T-Shirt in our weekly contests. If there are no valid entries for the week, then previous winning photographers other entries will be considered. Entries must be posted before the end of the day on Monday midnight, C.S.T. according to the clocks on our systems. Posts made after this time will be left up, but will not qualify for prize consideration for that week, and will be coinsidered for the next weeks drawing. Staff and volunteers of OnlineHobbyist and its associated sites are ineligible to participate in the contest though they may certainly post their photos as well. Neither kingsnake.com nor its parent company, OnlineHobbyist.com Inc., are directly affiliated with Nikon Incorporated. The Nikon trademark, logo, and products found on this site are the property of Nikon, Inc. and OnlineHobbyist.com Inc., in no way, claim to represent or own any of the Nikon trademarks or rights. Nikon, Inc. does not own, endorse, or promote OnlineHobbyist.com Inc., it's contests, or any of its websites. The NIN pic won over the entries of 2006jaywest from the same week. It is my understanding reading the rules that a week is Tues 12:01am through Sun 12 midnight. NIN pics were posted on Thurs. the 12th and 2006jaywest's pics were posted on Fri the 13th way inside the timeline for inclusion in the same week. My photos were posted the following week so I am just interested to see how the judging goes and when the actual cutoff is. Chill Out Moondog - it's just a T-Shirt! Jay had already won a T-Shirt in the contest and I am sure if he was doing this just for more leisure wear he would just ask me at the next show I ran into him at. At the rate we are going it looks like pretty much everyone that partcipates this year will end up winning a shirt, barring some huge rush to the gallery, and in the end all the concert photos someone enters in the contest are considered for the Nikon, not just the monthly winners. It's not the T-shirt prize that had me wondering it's that I thought it was a contest for the BEST photo posted no matter if you had won previous. I'm really not trying to sound bitchy or nitpicky. I just think the photos should win on merit, not a "spread the wealth" approach. I am gladly going to post more pics because I like the opportunity for as many people to see my work as possible. Checked my email, nothing there. I wanted to stop by & just mention I love a good contest. I think this is a good contest..... I like seeing what others are able to catch while at shows all over the globe. It would also be nice to see a list of the weekly WTF Ipod shuffle contest & the monthly Ipod winners. When you entry something & never see the award ( reward ) it feels a lil akward. Also is there a way to leave comments for the pics in the contest ?